Hi friends! So many of you have been asking questions about how I do it all, how I plan our year, how I keep up with household responsibilities, and how I remain sane while doing it all? 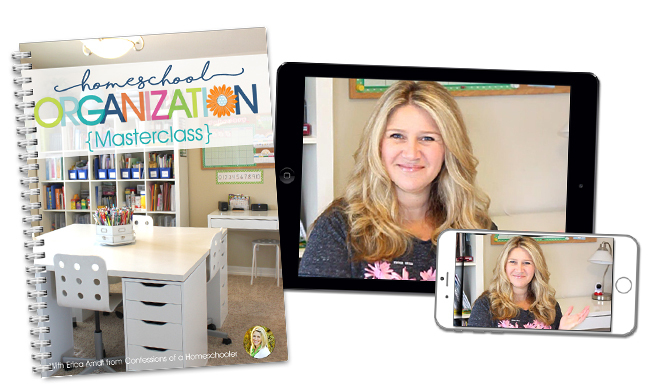 I’m super excited today to release my brand NEW Homeschool Organization Masterclass! 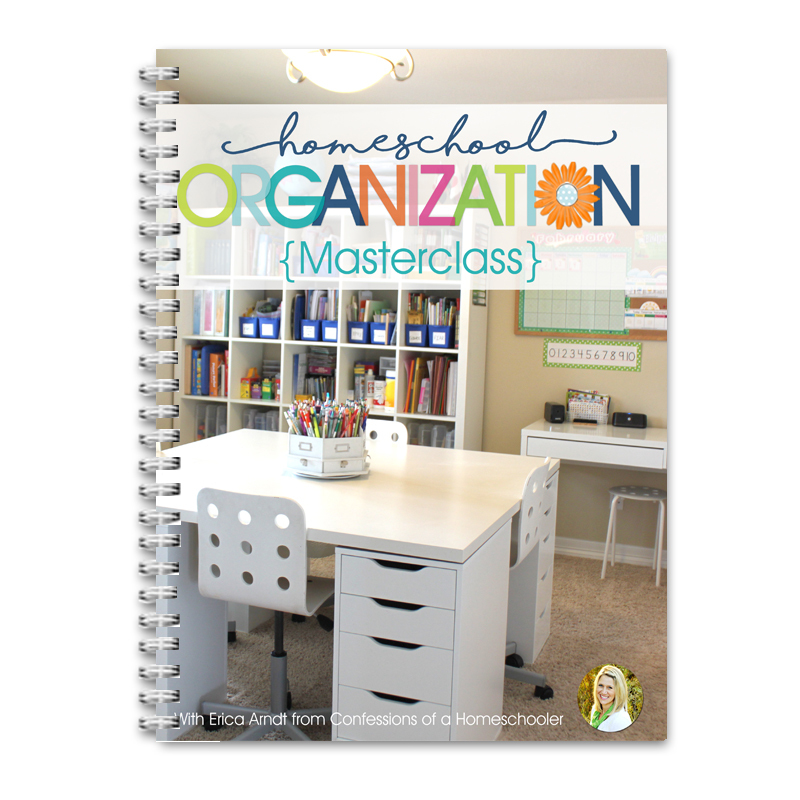 This eCourse is going to be all about Organizing and Running Your Homeschool Household! What makes this class unique is that I am going to show you how to both organize your homeschool and how to manage your home at the same time! We’ll talk about balancing chores, cooking, cleaning, laundry, and extra curricular activities as well as homeschooling so you can have a nice smooth homeschooling year! Discover How To Organize Your Homeschool Around Your Unique Family – Right Now! Let me show you how to blend flexibility with structure so you can have your BEST HOMESCHOOLING year yet! Homeschooling is NOT always easy, and as a matter of fact it can become quite overwhelming if you do not have a good plan in place. But I am here to help show you how to organize your home and your year to best fit your family’s needs best! Trying to manage your home, chores, laundry, cooking, cleaning, extracurricular activities, and homeschool can get overwhelming! All of the curriculum and homeschooling “stuff” can start to take over the house. And before you know it chores are not getting done, laundry is piling up, and school is chaotic at best. But don’t worry, I have a plan that can help YOU! What makes this class unique is that I’m going to show you both how to organize your homeschool and manage your home at the same time! We’ll talk about balancing chores, cooking, cleaning, laundry, and extra curricular activities, as well as homeschooling, so you can have a nice smooth homeschooling year! I have designed this course to help you get organized, motivated, and have the best year yet! Through our series I’ll be there every step of the way to help guide you through the process of organizing your home and maximizing your time so you can get everything done while still having time to enjoy your family in the process. Learn Helpful Strategies For Organizing and Running your Homeschool Household! This is a self-paced 10 video series class that includes several BONUS downloads to help you organize your homeschooling year and your home! Once you join the course you’re welcome to download the materials and view the video lessons at your leisure making it super flexible to fit your schedule! Learn practical tips on how to organize your day-to-day homeschooling life, motivate yourself and your kids, and get into an relaxing and fun homeschooling groove! Here are a just a few of the things you’ll get with my Homeschool Organization Masterclass! Time management training along with information on software, planners, and tools. Learn how to create a day-to-day realistic homeschooling schedule including household chores. Learn how meal planning can save your sanity and your budget! Learn a variety of ways to organize your kids’ curriculum and work areas. Learn how to organize all of your teacher materials including all of that homeschooling “stuff”. Learn how to teach multiple grades while remaining sane! I’ve added a bonus video tutorial that will show you how to prepare and plan for your entire homeschooling year in advance. With my tips it’s super easy to plan ahead. Then when school starts you can relax and enjoy time learning with your family! Prepare for and plan your entire year before it starts! Organize your daily household chores and fit them into your homeschooling day. Create daily working lesson plans and student planners. Organize all of your homeschooling stuff for both your students and yourself! Join Me Now and Get These Special Bonus Items! The downloads are all in PDF format and may be downloaded and printed as desired. To save on ink you can also read the books on your devices as well. There are also schedules and a monthly meal plan which are editable word docs that you can customize to fit your needs. BONUS #3 – Homeschooling 101 eBook: Guide to Getting Started and Staying the Course! Join me TODAY and start enjoying your homeschooling journey! Can you join anytime or do you have a certain time you can join. I want have the funds until the start of the school year. I need to know that I join as soon as I can.